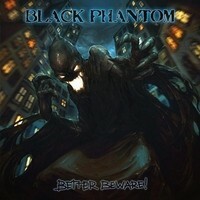 Home » Reviews » CD » B » Black Phanto…tter Beware! Instead of resting, it is back to work. Not the usual routine but an extra. It was probably not enough for MESMERIZE’s bass player, Andrea Tito, with the constant activity with his mother band. Due to that, other than taking a breather, he went on forming another band, and named it BLACK PHANTOM. I might call it a back to the roots thing, even if he already has a band that isn’t that far from the new emerging entity’s direction. He even took two bandmates to carry the new vision with him. Anyhow, it was set and with material that has been laying around somewhere in the dark, bred to life and into a debut album titled “Better Beware!”, which was signed to the local Punishment 18 Records. Also it surprised me that these guys are actually going to support this album, as if there isn’t a bigger band in the midst, with that said, hats off to them. The rising of BLACK PHANTOM, and its debut output, marked another British invasion to Italy, and this time not for the purpose of war. In an own obscure manner, this band slowly became a kind of Italian IRON MAIDEN, and without being a tribute band. Taking on a vocalist that is a cross breeding of Bruce Dickinson and Tobias Sammet, having a crazed bass player that is not far from being the lost child of Steve Harris, embracing the old juggernaut’s thin Marshall sound of the mid 80s, low tuning the guitars to make it slightly heavier, writing music that is in close proximity and from there on unleashing a setlist of songs that are a pure exploration of the IRON MAIDEN universe. Even if it looks that way, I can tell you without a doubt that this is certainly not a copycat band. I have the feeling that I know what you are thinking right now. Generally, I can argue that “Better Beware!” is under my made up category of borrowing, because BLACK PHANTOM proved that they had what it takes to compose material that would eventually create them an image of their own. Which means that though there is no such thing as picture perfect, the Italians conjured up a good starting point which I believe will lead them further forward into becoming more original. BLACK PHANTOM showed that they have a good sense for creating epics, such as the historical war affair of “Firebase Valley Forge” and the final original tune “King Of Bottom Feeders”. Frankly, both songs are as if a hybrid between the “Piece Of Mind” and “Powerslave” periods of MAIDEN. Furthermore, there is much enthusiasm in their methods of revamping the old British flame that isn’t necessarily based on MAIDEN but others of the same circle, with the ardent opener “Light Behind The Armour” and its energetic mad follower “Black Phantom”, both showing signs of others like RAVEN / SATAN / TOKYO BLADE. The approach on “Less Than Zero” appeared to me as something for the audience to get hooked on, a type of anthem that explores the fine voice pattern of the band’s singer. Others that should be mentioned: “The Absence” and “The Invisible Man”. Being somewhat far from originality doesn’t mean that it is bound to falter. Nothing of a sort in this particular case. I trust that BLACK PHANTOM are no mimic, mainly a cause effect of their bass player passion and devotion for a band that laid down the law for countless of others. The overall quality is good, and it is only a matter of time, if continued, that this band will flourish.